VINELAND, N.J. (WPVI) -- The all-clear has been given at Cumberland County College after a hostile intruder alert on Thursday morning. A lockdown that had been issued earlier in the day for the Vineland, New Jersey college campus has also been lifted. According to the school, around 9:30 a.m. Thursday, the Vineland Police Department contacted the college's security. They ordered the college to issue a lockdown as a precautionary measure due to a threat notice they received concerning the neighboring hospital Inspira Medical Center Vineland. A message on the college's website during the lockdown read: "Secure yourself in a safe location. Remain in a safe location until additional instructions are received. Silence any mobile devices. If you are not on campus please stay away." 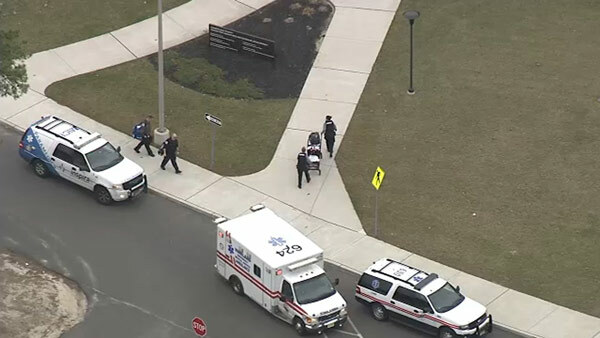 Chopper 6 over the college, located on the 3300 block of College Drive, showed medics bringing a stretcher into a building around 10:45 a.m. A few minutes later, a woman was carted into an ambulance. She appeared to be alert. It was not known why medics were attending to her. The lockdown was lifted around 11 a.m. with a message on the site reading "All Clear - Return to Normal Activity." "We are grateful to our security, faculty, and staff, for keeping our students and visitors safe," the college stated. All college business, classes, and other activities have returned to their normal schedule.